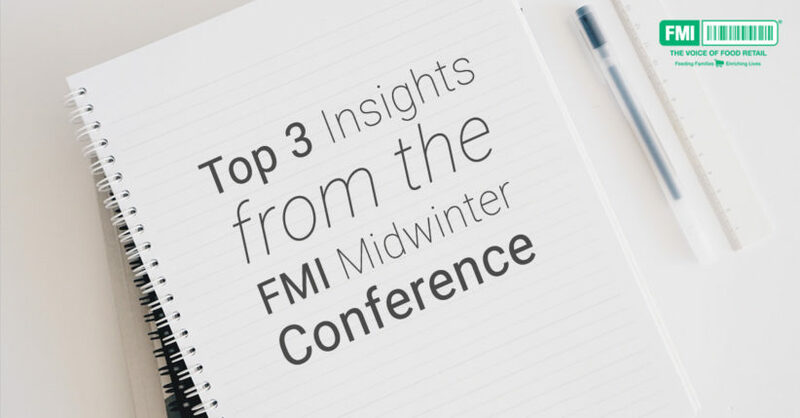 The FMI Midwinter Conference united forward-thinking executives from leading grocery and CPG companies, and I was thrilled to hear their insights into the industry landscape. Following the conference, I got the sense that grocery stores and supermarkets are on tornado watch. There are storms lurking on the horizon, the possibilities of drastic change and opportunity that are sure to shake up the status quo. Everyone has their “storm” radars poised to the future— how will grocery stores compete as the customer experience shifts online? What untested innovations should supermarkets invest in now to capitalize on upcoming consumer habits? 1. Amazon Go is Goliath for supermarkets. Facing supermarkets and CPGs in the arena is, of course, Amazon. Companies are bracing for impending disruptions like Amazon Go. If you haven’t heard, Amazon plans to build out personless grocery stores, where customers simply take the items they want and go, without having to go through a cashier. Shoppers are automatically charged via their Amazon accounts. Amazon Go is made possible by advanced implementations of AI. It’s clear from FMI that this drastic change to the market is at top-of-mind for grocery stores. How to address this change brings me to my next insight. 2. Companies should consider the innovator’s dilemma. One of the most poignant representations of the state of enterprise leadership came in the form of the innovator’s dilemma. The dilemma suggests that large companies tend to focus on sustainable innovation, increasing the power of their products and refining the user experience. In contrast, start-ups are better equipped to pioneer disruptive innovations — the less polished, niche market solutions that are truly different and untested. This choice between sustainable innovation and disruptive innovation is the crux of the dilemma. Enterprise companies can serve their short-term needs by investing resources into existing solutions, thereby keeping their current customers happy. Or, they can invest in the longer-term disruptive innovations that may or may not work, that are untested and unproven, but that can address their customers’ future needs. Finding the balance between this either/or dichotomy may be key for supermarkets and grocery stores looking to excel in the next few years. Devoting resources toward innovation in niche markets can strengthen a company’s roots in the face changing winds. Amazon, after all, has championed its own disruptive solutions that everyone can’t stop talking about. Other grocery stores and supermarkets are taking note. 3. AI is at the forefront of innovation. I’d be remiss if I didn’t discuss the significance of AI at the FMI conference. Different implementations of AI are driving disruptive innovations— so much so that a robotic workforce no longer seems isolated to the realm of science fiction. These modern robots aren’t enemies to be feared but are powerful allies in business. AI, through its exhaustive computational skills, is well-poised to aid in building real relationships with customers. The sheer speed at which AI operates is widely unmatched. In our own experience, we’ve leveraged AI to condense complicated analysis and reports into a matter of seconds— a process that, in human hands, would take weeks. This power of AI can seem threatening to business people who wonder if they’ll be replaced by C3POs. But AI isn’t a replacement; it’s an enhancement. AI relieves the burden of routine reporting and other perfunctory but important tasks. By lightening the load of repetitive reporting, AI enables business people to quickly identify causations in their data and start creating strategy. People, after all, still possess the lion’s share of creative and innovative thinking skills. These are the skills businesses need to leverage, and AI is a means of putting the focus back onto the human aspect of problem-solving. As these changes take effect for grocery stores and supermarkets, CPGs will need to pivot, too. Innovation is important for all players on this field. The innovator’s dilemma in particular reminds me of a story shared in a CGT webinar (Tech Trends Report), in which Oreo customized packaging and innovated music boxes, hitting the niche market with disruptive innovations. Oreo, a brand that’s more than 100 years old, has embraced innovation to personalize their products. CPGs should consider how their tools are helping them achieve these kinds of goals. Watch the CGT webinar to learn more, or request a personalized demo below. See how AnswerRocket can augment CPG and grocery businesses with AI. Try us out with a custom demo.